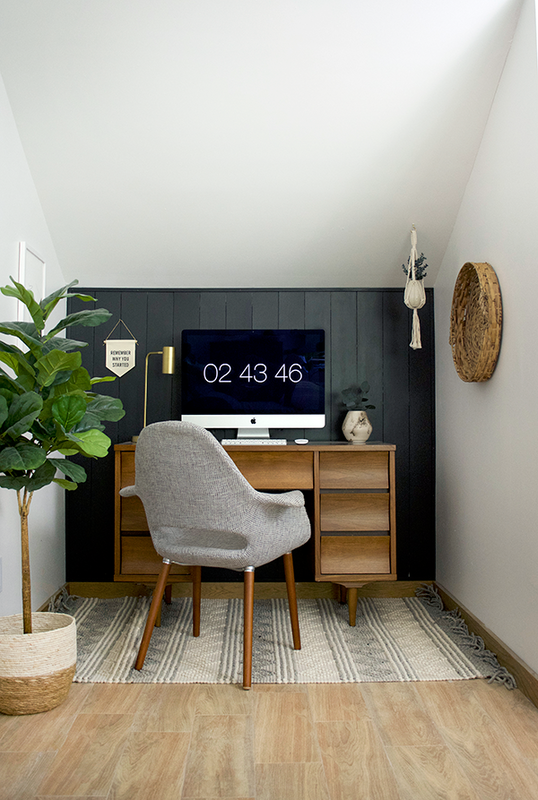 This project definitely took longer than I expected, but only because once the dark vertical shiplap was up, I got the itch to redecorate the whole space. 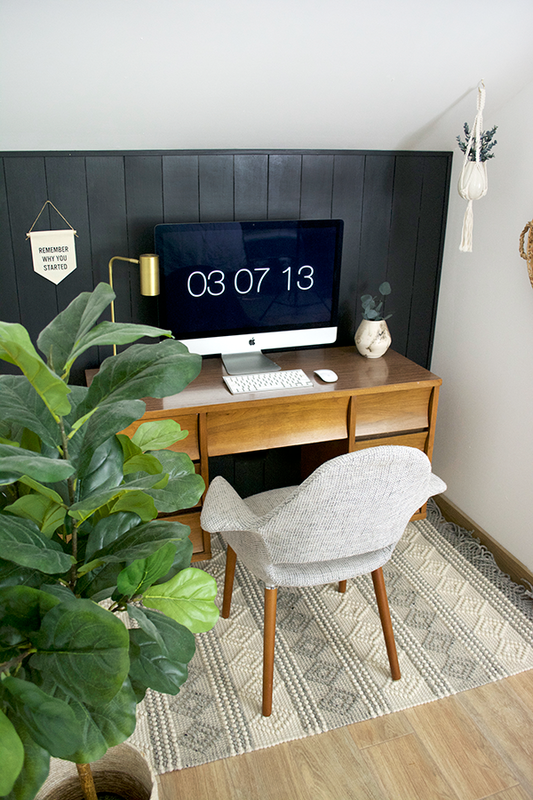 I intended on just adding the accent wall and redecorating with what I already had, but we all know how that goes ha. 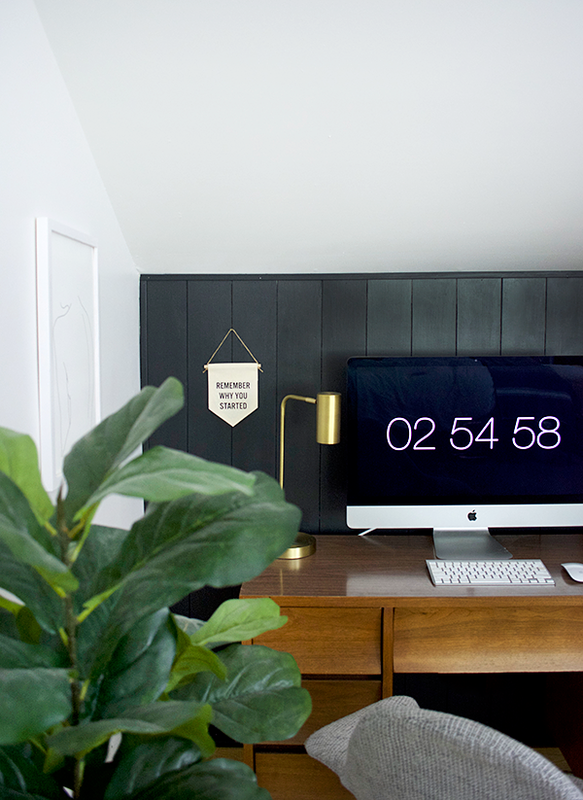 While I did use some items I already had on hand, I brought in some new things that totally made this space. I used to walk by and feel so blah about it, but now every time I see it, it puts a big smile on my face. 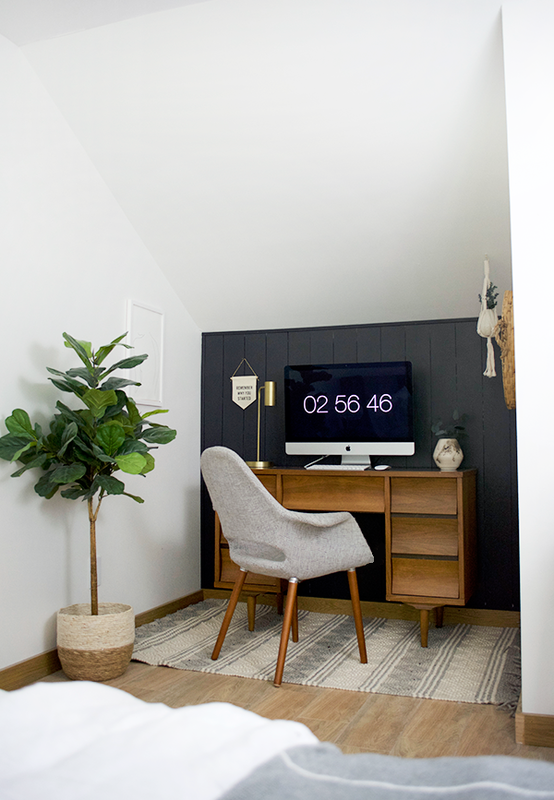 Adding shiplap to a wall is the perfect way to add some character and interest to a space and with all the white in our room already, it was the perfect pop of color that was needed. I always get nervous about painting a wall dark, but this is the second time I’ve done it (the first being in Hawkins’ Nursery) and I haven’t regretted either one. 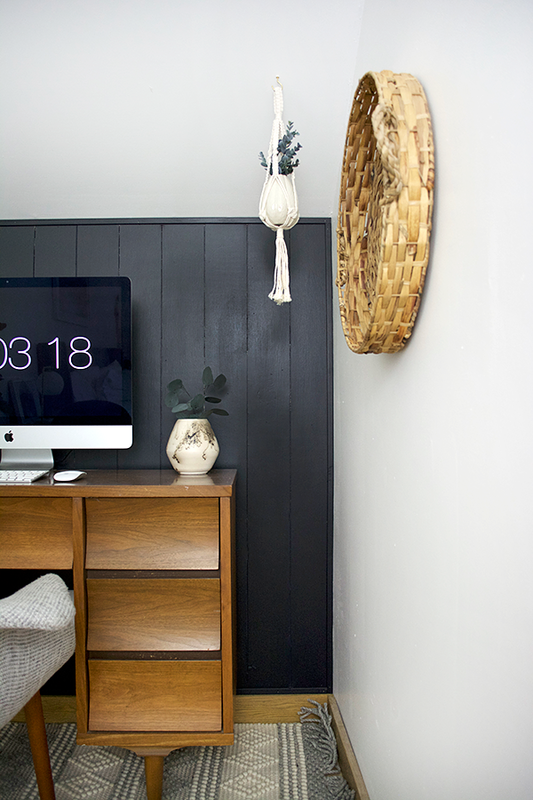 This is a super easy project that should only take a day or a weekend depending on how big your wall is. Mine was a pretty small wall and since I was working between nap times, it took two days to complete. 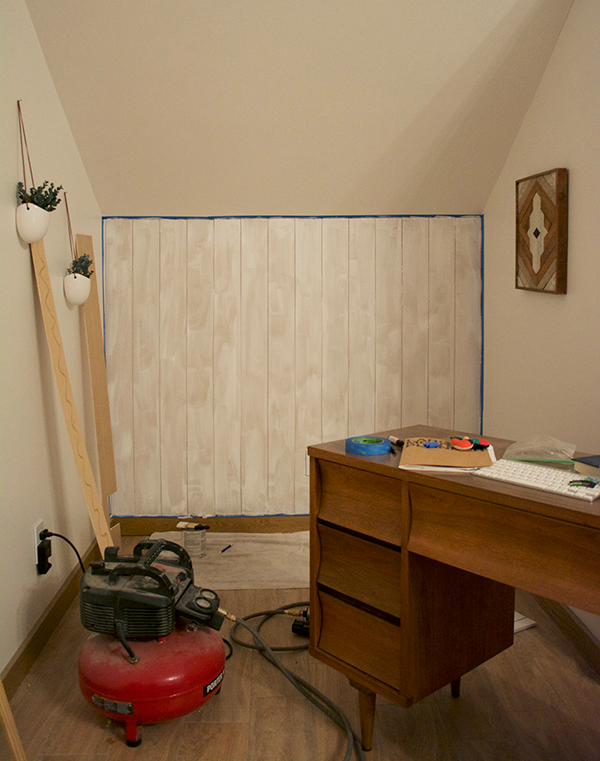 This is what my little nook looked like before we added the shiplap. It needed some help. Cut your plywood into strips. As I mentioned above, we went with 5″ wide strips but the width is totally up to you. 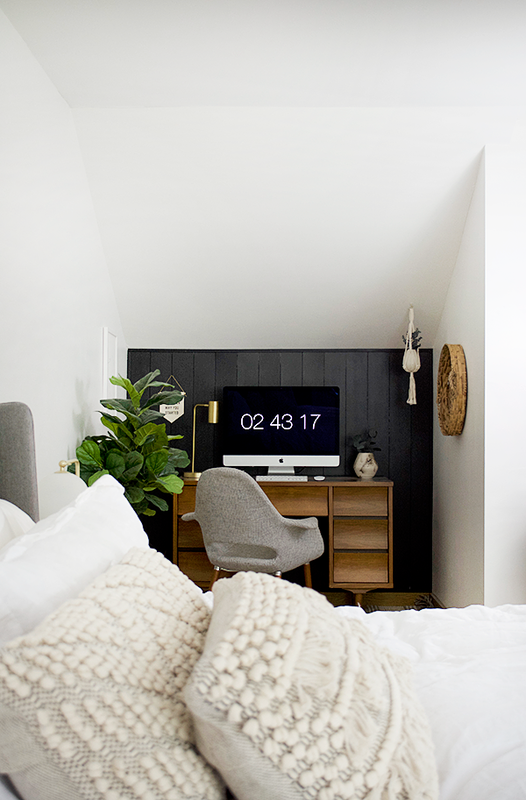 Just make sure you measure your wall to see how many you’ll need so you don’t end up with one piece that is way shorter or longer than the others. 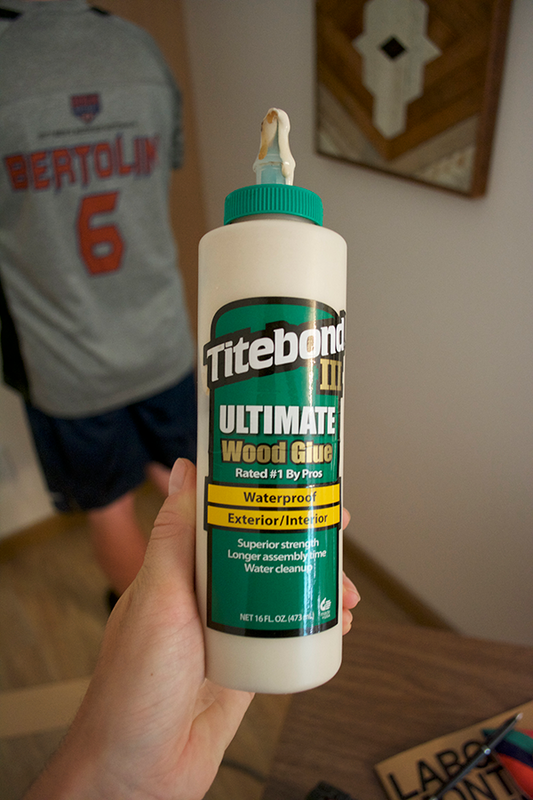 Apply some wood glue to the back of your wood before placing it on the wall where you want it to go. This will help hold your planks in place a little better. 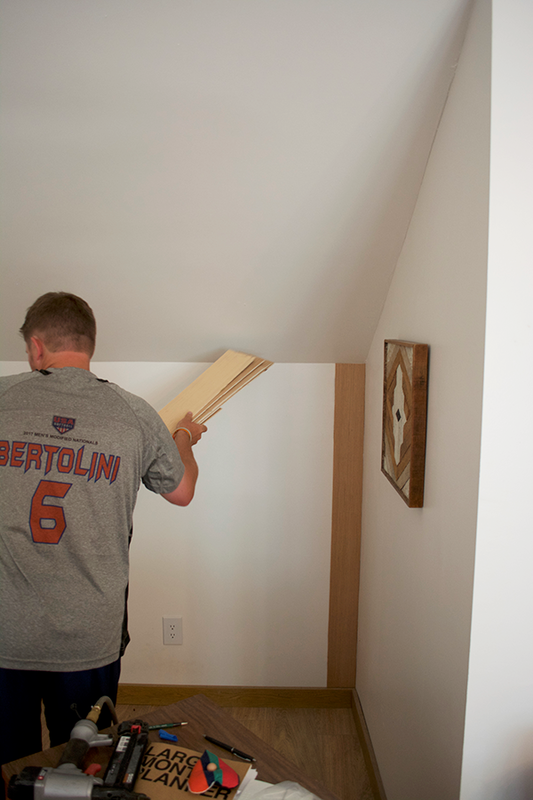 Use your nail gun to nail your planks to the wall. We did 3 – one near the top, one near the middle and one near the bottom. You can use a spacer if you want (like a nickel) or just wing it which is what we did. Use wood filler to fill in your nail holes. 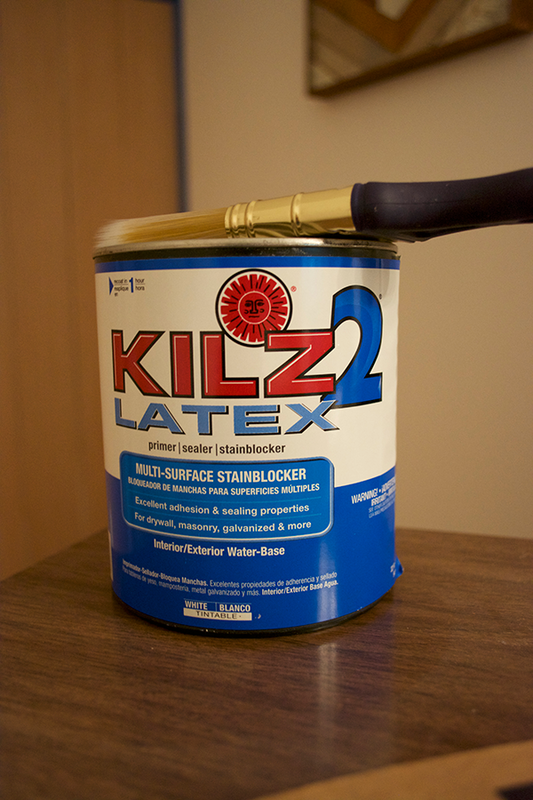 Once dry – sand them down using a sanding block or some sand paper. Tape around the outside of your wall and then Prime! I used a 3 inch angled brush and applied one coat. Once your primer is dry, you can paint! I used the color Noir by Valspar. Now as you can see the boards are a little uneven around the edges and I wanted a nice clean look. A lot of times in an old house your walls might be compeltely even and you’ll run into this issue even if all your boards are the same length. An easy way to fix this is to just add some trim around the entire outside. 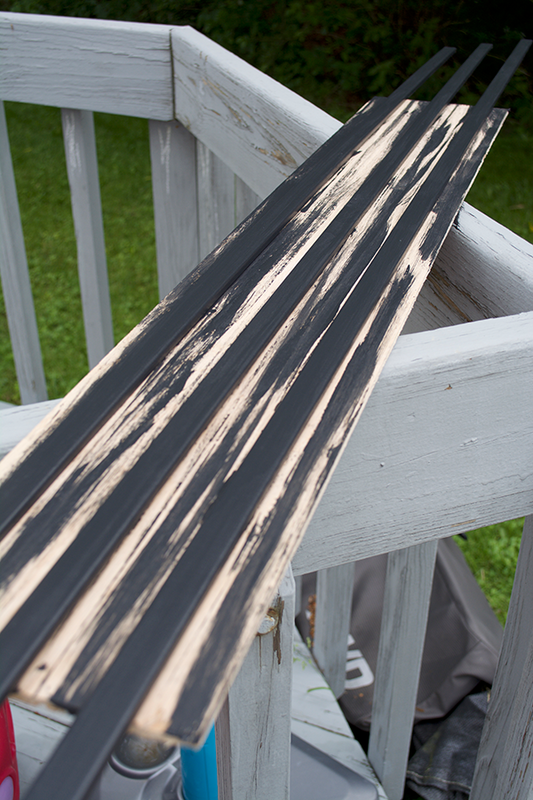 Paint your trim and attach it using your nail gun. I just use some extra paint to fill in the holes and you can’t even tell they’re there. And that’s it! You could definitely add the trim before you paint everything. But I wanted to see how it was going to look first without it and make sure I wanted to add it. I love the vertical look but you could also change it up and do black horizontal shiplap like my friend Aniko did in her bathroom. Then it was time for the fun part – decorating! Ah I just love this space so much better now. It feels so much more me and totally vibes with the rest of our room. I kept the chair and desk the same but that’s about it ha. I did already have a few things laying around that I used though so I didn’t spend too much on this little makeover. The game changer is the rug. The one I had before was this weird sized remnant of a vintage rug I got off eBay. And although it was beautiful, it didn’t fill the whole space and I think that made it feel even smaller. Loloi Rugs reached out to me about working together, so I figured I’d see if they had anything that would work for this space. Once I saw they carried the Magnolia line, I was all in. 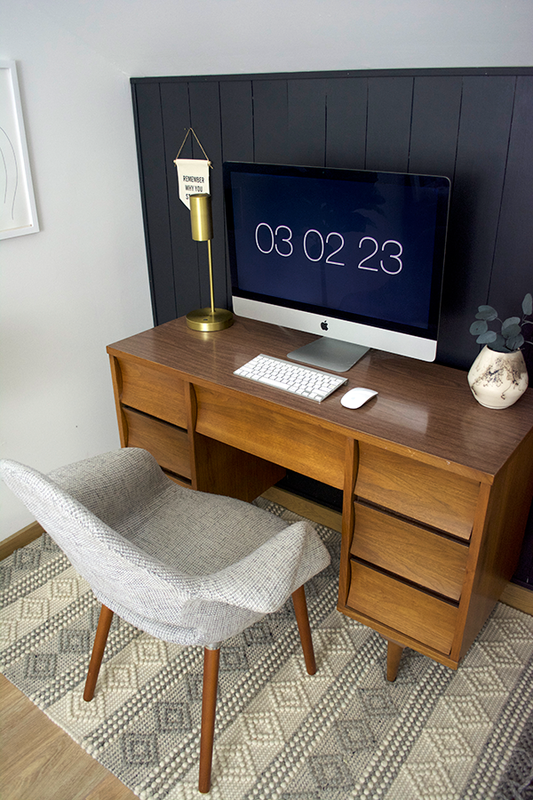 This guy is the Holloway Grey Ivory Rug and I’m obsessed. 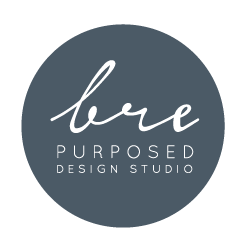 The texture goes perfectly with the throw pillows on our bed and the large pouf at the end of our bed. It was totally meant to be. I got this really cute vase that’s on the desk in Cape Cod when we were there on vacation. A local artist was selling them and she makes them using this cool method with horse hair. I decorating with things I get on my travels – it always adds that more personal and unique touch. The hanging macrame is from Amazon and the vase inside is from Target. 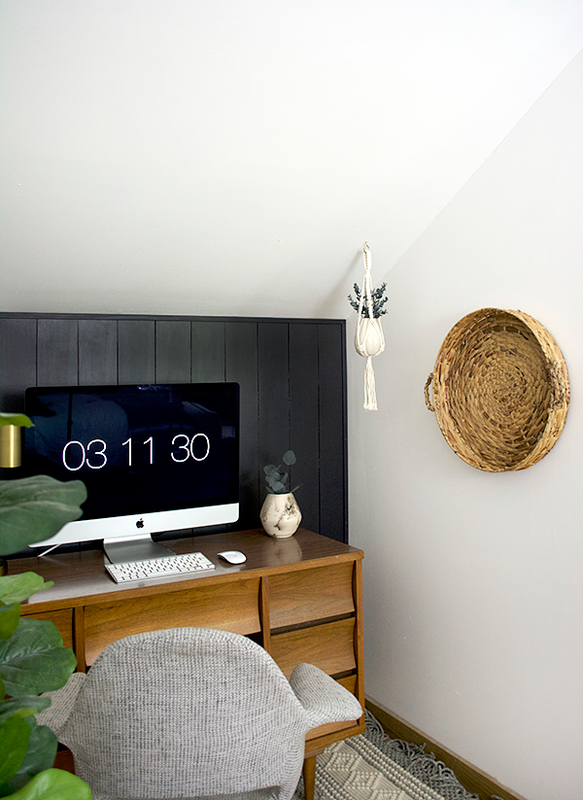 The basket on the wall is from a friend who brought over some fresh flowers earlier this summer. She found it at a local thrift store. I stole the plant from our bathroom so now I need to find a new one for in there. I brought it over just to see how a plant would look, and ended up loving it over here so decided to keep it. I snagged that cute basket at JoAnns and kind of wished I grabbed more! 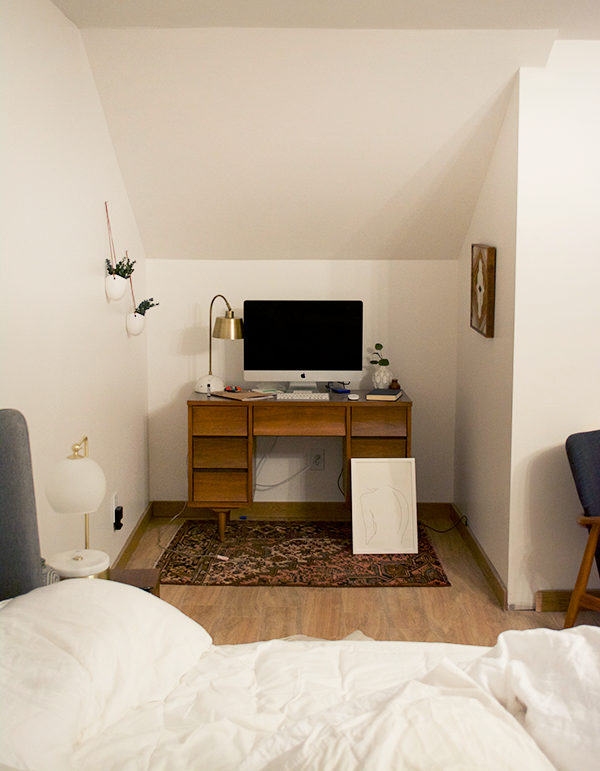 The minimal line drawing artwork on the wall is a poster I had from Society6. I got it earlier this year and was going to use it in a different spot but it didn’t end up working out. I love it here! I got this cute little banner custom made from Autumn at Matriarch Handmade. I saw this quote on Pinterest a while ago and knew I wanted to incorporate it into my office space somehow. I have another one of Autumn’s banners in Hawk’s room and thought it would be the perfect way to display these words. 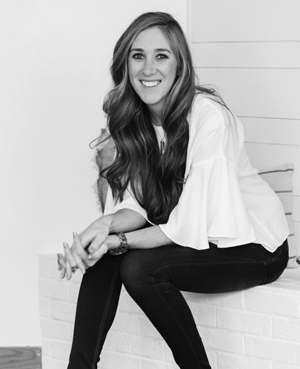 It’s so easy to get caught up in the hustle and bustle and competition of blogging and life in general. These simple words help remind me of the real reason why I do what I do and to never forget where and why I started. And lastly, I got a new lamp. My old one was just a little too large for my desk, so I downsized a bit and got this cutie from Target. Love everything about this space! Where did you find that cute chair? Thank you! It’s linked at the bottom of the post! 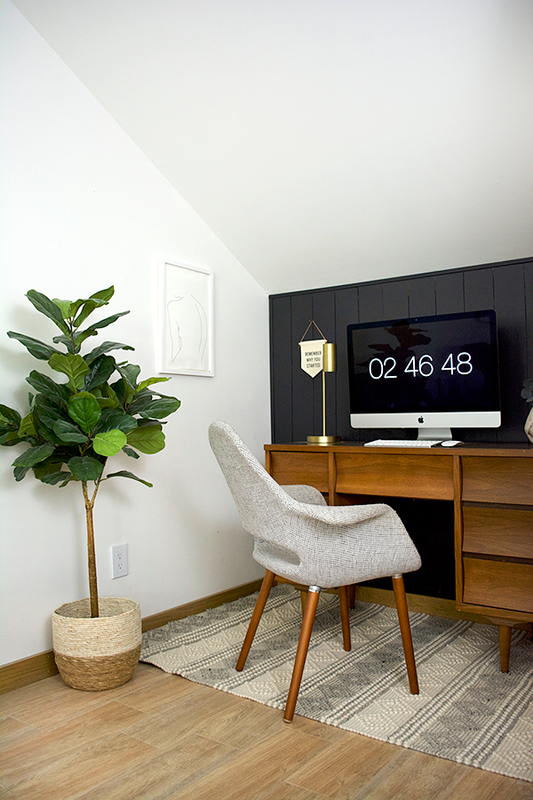 Love the dark wall! Looks great! Love it! 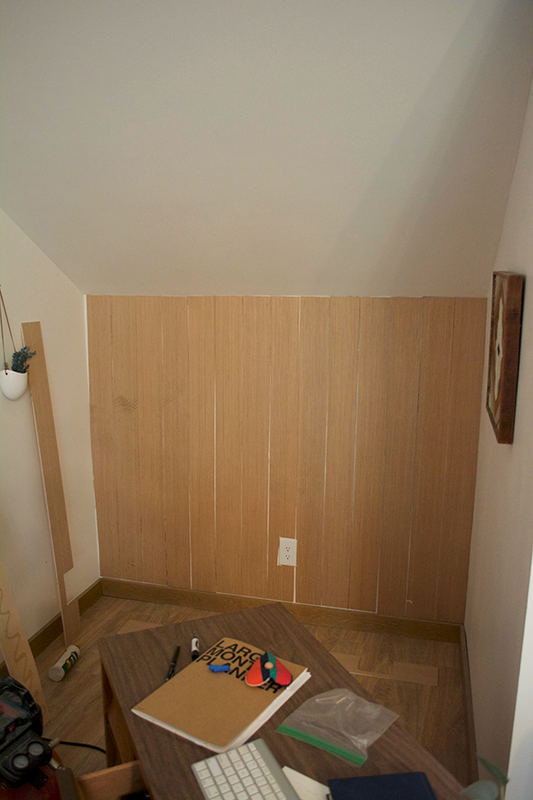 I can’t quite figure out the gaps between the boards where early in the pics you can see your white wall. Did you fill in these gaps with anything or just dab the brush in there to get the paint in between? 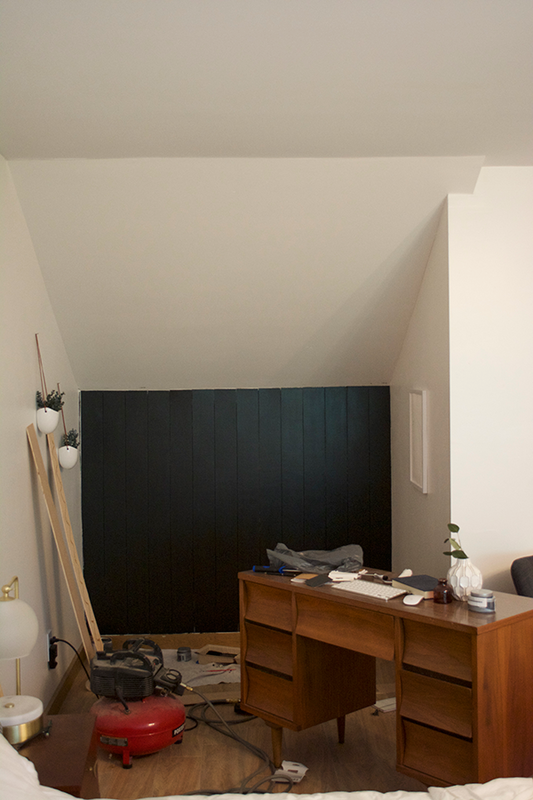 Or would it have been easier to start with a dark wall anticipating those gaps? Thank you! Hi Mary! So when I started I wasn’t sure if I was going to want to paint the planking white or go dark so I left it as is and then used a smaller brush later on to get into those gaps. If you know what color you’re going to paint then definitely paint the wall first! Where did you buy the cute little plant? Thank you! I got it at Michael’s last year! Love this look! Nice job!